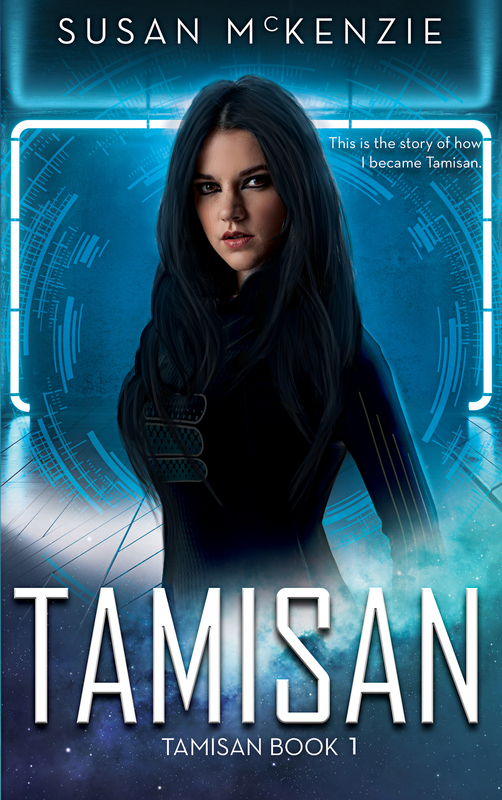 Here is a sneak peek of Chapter 1 of Enigma (Tamisan Book 2)! Enigma will be released on 16th February, 2019. Stepping out into the sunlight was like stepping into one of my nightmares. The jungle with its vines intertwining around the trunks and branches of trees, the flowers and fungi dotted amongst the green, the smell of earth and damp wood, the humidity crowding in on me. The memories it evoked were choking me. I took a few deep breaths and tried to push my fears aside. We’d touched down in a clearing in the jungle made by fallen trees and as I stood at the door of the shuttle battling my demons, I was struck by the sheer beauty of the trees and flowers that were growing beyond the immediate area and by the height of the tallest trees. They had to be at least sixty metres tall. Despite the magnificence of my surroundings, my breathing became shallow. I had to fight to keep control of my emotions. Moss grew on rocks and tree roots, vines hung from branches, and flowers of many different colours bloomed in amongst the greens and browns. The sense of deja vu made both my hearts hammer wildly in my chest. The last time I did this — landing in the jungle — it had ended in tragedy. The humidity pressed in on me, but, unlike the first time, it didn’t bother me. My skin drank in the moisture without causing the least bit of discomfort. The other members of my team stepped down onto the ground but I hesitated. I forced myself to slow my breathing and calm my thoughts. I could do this if I concentrated on the present. I forced myself to move and took the three steps to the soft earth and stood behind everyone in the clearing — if you could call it a clearing. It looked like a war zone. Trees strewn about the floor of the jungle, some of them caught by the branches of surrounding trees, which stopped them from reaching the ground. I gasped when I saw blood on one of the nearby tree trunks. “Looks like a couple of dinos had a wrestling match,” Darion said with a chuckle. That got a few laughs from some of the other men on our search team, but it had the opposite effect on me. It made me think of the two dinosaurs that fought right in front of me while I hid in a crevice between two rocks only a few weeks ago. One had resembled an Allosaurus from Earth’s distant past and the other looked like a giant crocodile. My hearts picked up speed again just thinking about it. I could almost hear the horrific sounds of them fighting. I took a deep breath to try to relieve the tightness in my chest. I didn’t want any of them to know how much being back in the jungle again was affecting me. I needed to be strong. I’d spent a lot of time convincing Darion and our boss, Dr Aimery, that I was up to the task. I wanted to help in any way I could. After all, the man we were searching for was part of my original shuttle crew when I’d first arrived on the planet about six or seven weeks ago. I closed my eyes for a few seconds and collected myself again. I can do this. Boots crunched in the leaf litter and I opened my eyes to Darion’s open arms. I melted into them, needing to feel his arms around me. It grounded me. My heartbeats levelled out and my breathing slowed. After a while, I reluctantly pulled away from him and gave him a warm smile. I used telepathy to send him a thank you. I nodded and we turned our attention back to our mission. Commander Totino Kozienko gave our team final instructions before heading out. I could see his bulging muscles on his bare arms and half a bare chest, but he didn’t look very ‘commanding’ dressed in a loincloth made of spotted hide. In fact, we all looked strange in skins. But blending in with the natives was key. As we moved further away from the ship, the fresh musty smell of earth and the refreshing scent of the nearby river filled my senses. Fragrances from the nearest flowers soon followed. It was such a nice change from the air conditioning in the underground base. I breathed in deeply and was hit with a wave of memories from the last time I was in the jungle. So many things had happened to me after I escaped from the crazy scientist who thought he could play God and transfer my consciousness into the body of one of the natives of this planet, a young woman named Sifayah. Sifayah was from a race of people known as the Waikari, who possessed psychic abilities. They could speak to each other using telepathy, which came in handy because they lived half their lives underwater. Certain members of the Waikari tribe also had the power of telekinesis. Sifayah was one of the strongest in the tribe with this Gift and had been trained well. My consciousness had been transferred into her mind and I’d only had her left-over memories to guide me in how to use her Talent. I was still amazed at the things I could do now. There were also physical differences. I still looked human, but I now had webbed hands and feet, and two hearts. I’d gained a lot: power and gills and abilities. But I’d lost so much at the same time. My life. My friends. My identity. I didn’t really know who I was for a long time. Things were better now, though. I had a new life and new friends, and my life had purpose again. I could use my abilities to help the Voyager Division study the people on this planet, and help find Janssen too. I needed to stop thinking about it all and focus, though I was finding it difficult to do. What was I thinking? I was so naive to think I could just come back here and carry on like nothing was wrong, like nothing bad had happened to me out here. Memories of being chased through the jungle and attacked by a man who thought he owned me came rushing up into my mind. My hearts were pounding again. I can’t do this. Why did I think I could do this? I had to calm down. I couldn’t let anyone know how the memories were eating at me. I did as he said, leaning against his side once he’d settled next to me. I closed my eyes and centred my thoughts. It’s okay. I’m okay. Turak isn’t here. He can’t hurt me. I pushed thoughts of what Turak almost did to me aside and concentrated on my breathing while Darion whispered that I’d be alright and rubbed my back. Once my heartbeats slowed, my thoughts turned back to our mission. We had no time for this. We needed to find Janssen. I nodded, feeling a little flushed, with a helping of guilt. We were holding up the team. I needed to be strong right now. I took a calming breath. I can do this. <Yes, you can!> He’d picked up my thoughts easily as I wasn’t shielding my mind from him. It was reassuring to hear him say it and to hear his voice in my mind. I smiled at him. I just needed to think rationally. Darion looked into my eyes and smiled. We had a couple of trackers in the group — Commander Kozienko, who used the old-fashioned method of tracking footprints and looking for clues, and Corporal Lazuli Idrial, who used his psychic ability to ‘find’ people and objects. His rating was only a T6, but he was good at his job. He’d been sick recently, which had slowed down our search for Janssen, and we were hopeful that this mission would be successful now that he was back on the team. We were also hoping that if Janssen was still alive, he would still be wearing his boots. That would separate his footprints from any others. The natives were usually barefoot or wore boots made of animal hide. The natives were unaware that there were people in their midst from the other side of the universe studying them from an underground base. We were wearing clothing that looked like it was made from animal hide to try to blend in. Well, except for mine. Mine were genuine jungle cat. They were given to me by one of the natives to replace my damaged wetsuit. It had been cut through from top to bottom by a being who was half-man, half-beast. I shuddered at the memory. As we meandered along next to the river, I tried to push any negative thoughts aside and enjoy the scenery. Plants were tangled around each other while the larger trees stretched high up into the canopy and blocked out most of the sun’s rays. It was slow-going as we had to duck under low-hanging branches and vines and climb over roots, rocks, and fallen trees. Just about everything was covered in a bright green moss and the leaf mulch was thick on the ground. I tried to ignore the creepy crawlies we passed, but it was difficult. Spiders and beetles and large ants and some seriously weird-looking hairy caterpillars with spikes and a colour pattern on their backs that looked like a big eye. The humidity was extreme. I watched Kozienko pull out a handkerchief and mop his forehead and noticed that Nykolar was panting and I sympathised with them. Nykolar was the only other person besides Darion and I that wasn’t a soldier and he clearly wasn’t as fit as the rest of us. He worked with electronics in Security. I wondered what he was doing out here. I thought it was odd that he would volunteer to be on the search team. After about five minutes, my breathing and heart rates were back to normal. The sights and sounds of the jungle stopped making me jumpy and I started to feel more confident. I could do this. I was able to think about the job at hand. It wasn’t going to be easy to find Janssen; the jungle was so huge and so dense that it was probably like the proverbial needle in a haystack. But we were hopeful. I’d survived, even though I’d been poisoned by a plant that made me hallucinate and had been captured and sold by slave traders. I was hoping that Janssen, being a tall, well-muscled male — who had some experience with hiking and camping according to his files — would be able to do a better job than I had. A lot of people could’ve done a better job than me. I was born and raised in a city back on Earth and was totally clueless. Which was why I’d been doing some self-defence classes since I’d recovered from being attacked by Dr Starrick, the scientist who had captured my crew and I in the jungle and experimented on us. The thought that he’d only grabbed us because he needed some test subjects to play with still sickened me and I was glad he was dead. He turned to me with a questioning look. He rolled his eyes and continued on. It was too late. The plant had a self-defence mechanism. The bulb on the base of the flower popped and the pollen went straight into his face. I quickly pulled him away from the tree. I was already pulling out my water bottle and as he slowly sunk to the ground, coughing and wheezing, I rolled him onto his side and poured water on his face. I had to get the pollen off. The others helped me and poured some of their water on him as well. Memories of the horrific hallucinations I’d experienced from this plant raced through my mind. My hands shook as I tried to move faster. It was already too late. The pollen had started to affect him. He was disoriented and looked at us with a dazed expression. This guy was in for a rough time. I couldn’t blame him for worrying. He saw what I’d gone through last time. And helped me use my telekinetic ability to expel the poison from my body. Everyone looked to Kozienko. “Do it,” he said. Darion moved back. “We need to take you to Jannali,” he told him. “No! How could you— What— No no no no no!” He batted his arms at an invisible foe and screamed again. Darion turned to us and said, “I’ll be back,” and before anyone could say anything more, they both disappeared. The rest of the group looked dumbfounded. “Yes, sir!” was the hasty reply. I couldn’t help wondering how I was supposed to give these men guidance if they wouldn’t listen to me. I had to hope that they’d listen now that the commander had spoken to them. Once Darion reappeared, we travelled through the jungle along a wide animal track. I shuddered to think of what might be able to easily walk through here, but pushed it aside. We were armed and alert. We understood what could come trudging along on its way to the river for a drink. When I was in the jungle by myself, I narrowly escaped being the next meal of a smallish Allosaurus look-alike. I say smallish, but it was at least two metres tall. I looked up as it seemed to be getting darker down here on the floor of the jungle. It was hard to see through the canopy but it looked like it might rain. At the sound of crashing footfalls through the underbrush, I turned and jumped back a couple of steps as a large dinosaur that resembled an Anatosaurus stumbled out onto the track and veered away from our group. Relief flooded through me once my mind registered that it wasn’t a predator. Everyone visibly relaxed and watched the Rhodon as it tried to decide what to do. I was so glad they’d listened to me as I didn’t want to see it hurt. We stood still and watched it pass. It had four solid legs similar to an elephant’s, and a long tail protruding from its large body. Its neck was thicker and shorter than the tail, with an oval-shaped head. It finally chose to avoid us and trudged off into the foliage. They all lowered their weapons and we started moving again as the sounds of its footsteps died away. It took a while for my heartbeats to return to normal. Having two hearts was good for swimming long distances, and I assumed that to be one of the reasons why the Waikari had more than one, but having both pounding against my ribcage the first time I woke up in this body had made me think there was something wrong with me. As we walked, I looked at the trees that seemed to go on forever. I hoped that Kozienko knew the way back to the shuttle, because I hadn’t been paying attention while trying to wrestle with my fears. All I knew was that we were still near the river. In a pinch, I could teleport back to where we’d landed. I could easily picture the fallen trees in my mind. There was an order from the commander to halt and we gathered around where he crouched in the middle of what looked like a smaller animal path heading off through the bushes. When we reached him, he pointed at the ground. “There,” he said, as if we could all see what he was seeing. I looked closely, but couldn’t see anything unusual. He pointed at an area to the right and I leaned closer. There was an indentation in the soft black soil, but whether it was boot-shaped was up for debate in my mind. But then again, what would I know? Just as I was straightening up again, someone screamed, “Incoming!” and all hell broke loose. If you enjoyed this chapter, just know that it will be available from 16th February, 2019, on Amazon, Kobo, iBooks, Barnes and Noble, Scribd, and more. 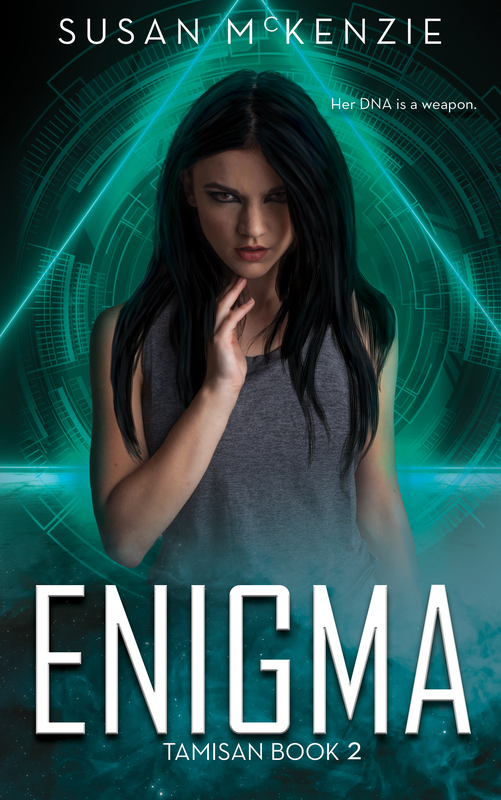 ← Cover reveal for Enigma!